H. Rocke Robertson at the Montreal General Hospital, 1960. McGill University Archives, photographic collection, PU044121. 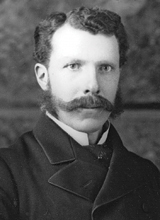 H. Rocke Robertson was a distinguished surgeon and the first McGill graduate to become Principal and Vice Chancellor of McGill University. 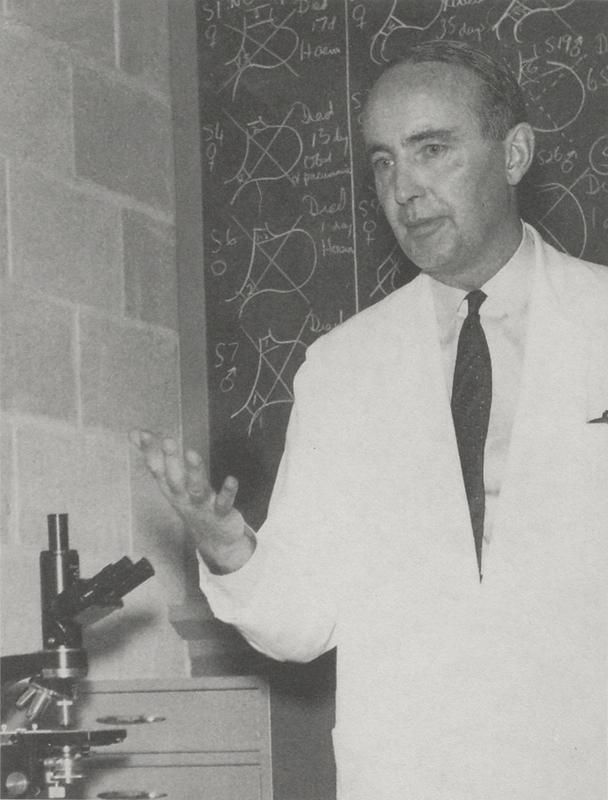 An enthusiastic supporter of the Osler Library, Dr. Robertson was an instrumental force behind the Osler Library’s move from the Strathcona Building to its current location in the McIntyre Medical Building in the 1960s. 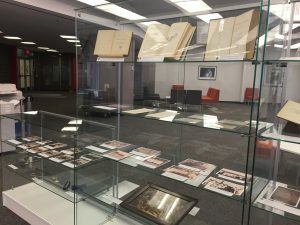 In 1972, he organized the Friends of the Osler Library whose financial support allows the Library to continue to buy material, preserve its rich collection, and make it available to others. 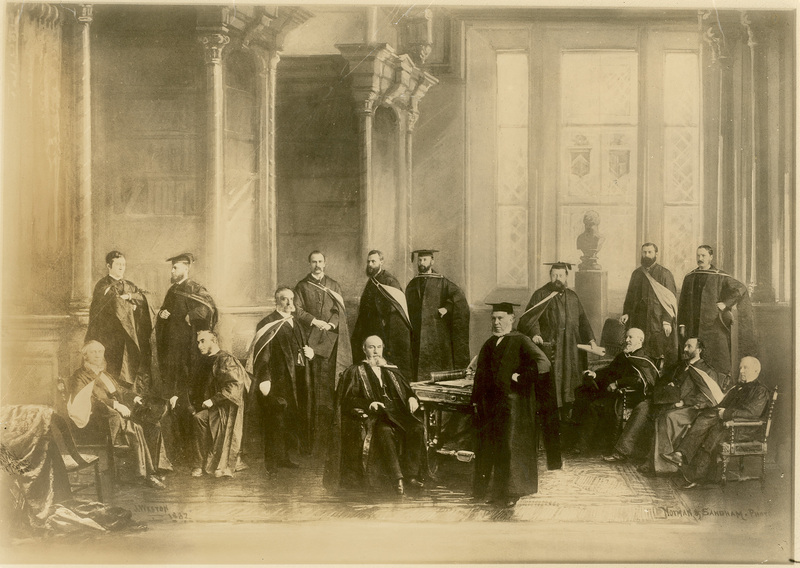 After the opening of the Francis Wing in 1978, a rare books room was named in Dr. Robertson’s honour; since the Library’s most recent reconfiguration, the entire area surrounding the Osler Room is now named in his honour, containing the Library’s manuscripts, archival materials, and post-1840 rare materials, all of which are identified with the location code “Osler – Robertson” in the online catalogue. 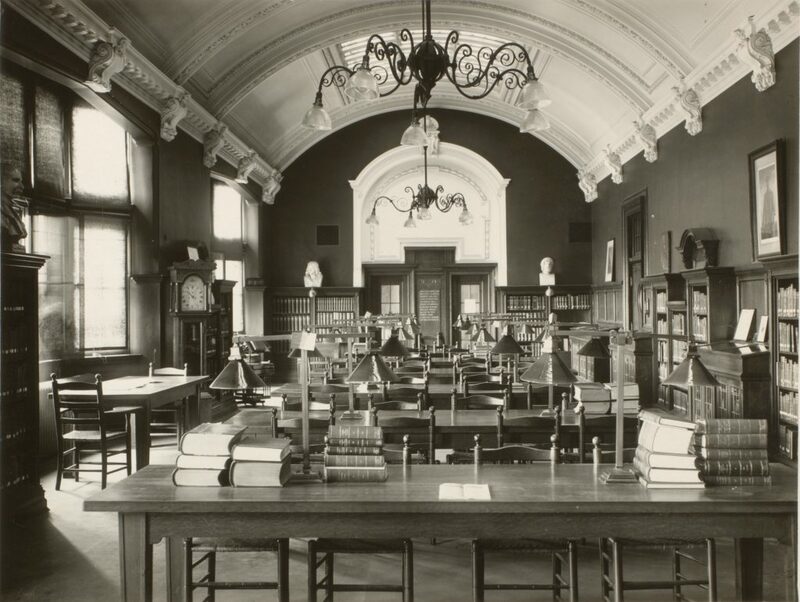 The H. Rocke Robertson Room at the Osler Library. Illustration from Lorenz Heister: Institutions de chirurgie […]. Paris: P. Fr. Didot le jeune, 1771. 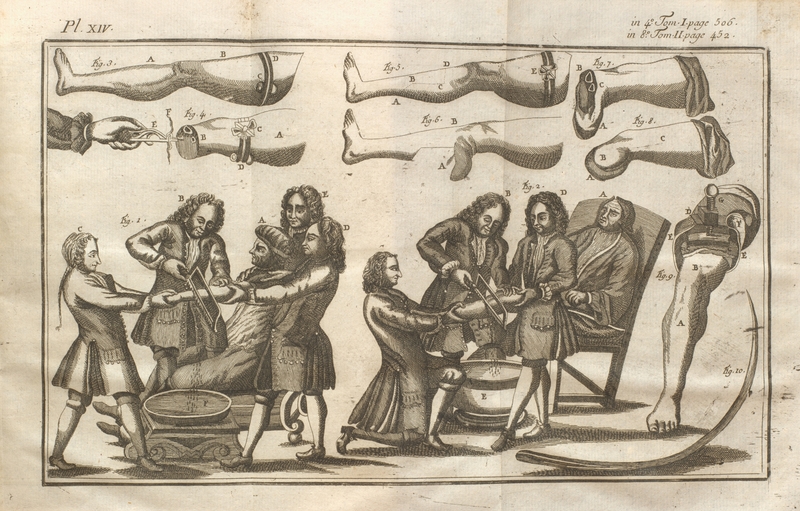 Dr. Robertson also contributed to the Osler Library’s collection of books, giving rare medical books, such as Lorenz Heister’s magnificently illustrated Institutions de chirurgie (1771), as well as an extraordinarily fine copy, with all plates intact, of the complete Diderot-d’Alembert Encyclopédie (1751-1780), one of the most influential publications of the Enlightenment. 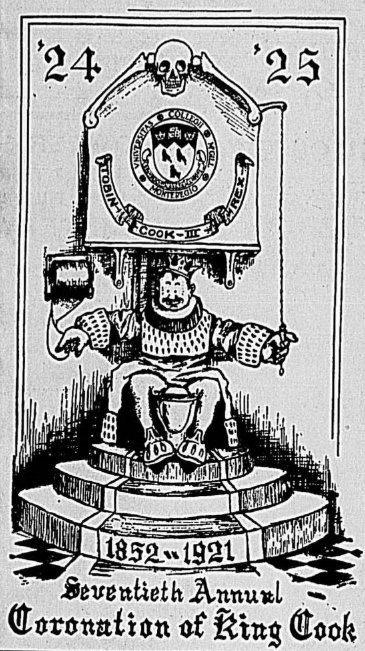 Encyclopédie, ou Dictionnaire raisonné des sciences, des arts et des métiers, par une Société de gens de lettres. 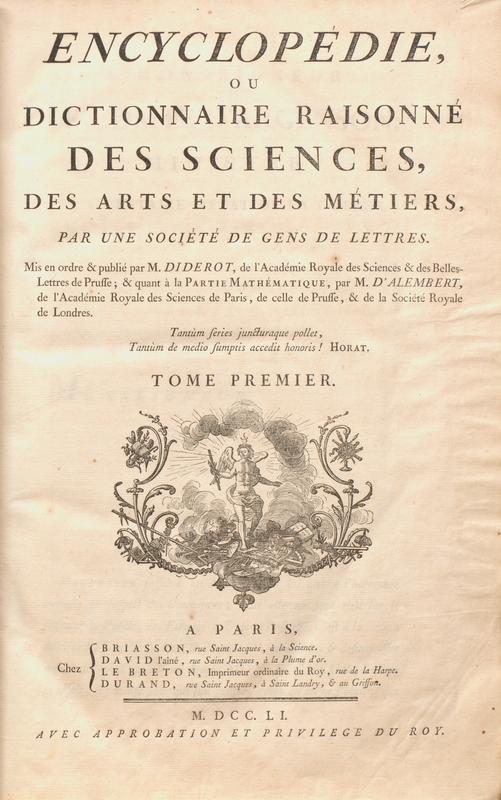 Mis en ordre & publié par M. Diderot […] & quant à la partie mathématique par M. D’Alembert […]. 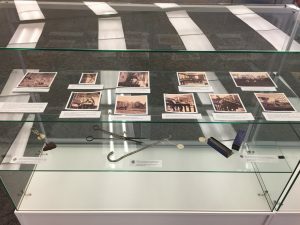 Paris: Briasson [et al. ], 1751. Title Page of the first volume. Among the numerous contributors to the Encyclopédie were, besides Diderot himself, Buffon, Voltaire, Rousseau, and Montesquieu. Entries on medical topics were under the direct supervision of Diderot, who, for instance, co-signed the article on anatomy. Many articles on anatomy, medicine, and surgery were written by Antoine Louis, one of the most eminent surgeons of his time, who later collected his contributions to the Encyclopédie in his own two-volume Dictionnaire de chirurgie (1772). “Gift of: H. Rocke Robertson” on the front endpapers of the first volume of the Encyclopédie. Several rare books from H. Rocke Robertson’s collection can also be found at McGill’s Rare Books & Special Collections, including rare editions of works by John Dryden, Oliver Goldsmith, and Samuel Johnson, as well as the 1686 edition of Thomas Browne’s collected works, whose Religio Medici was William Osler’s favourite book. The H. Rocke Robertson Fonds are held at the McGill University Archives. H. Rocke Robertson died 20 years ago on February 8, 1998. 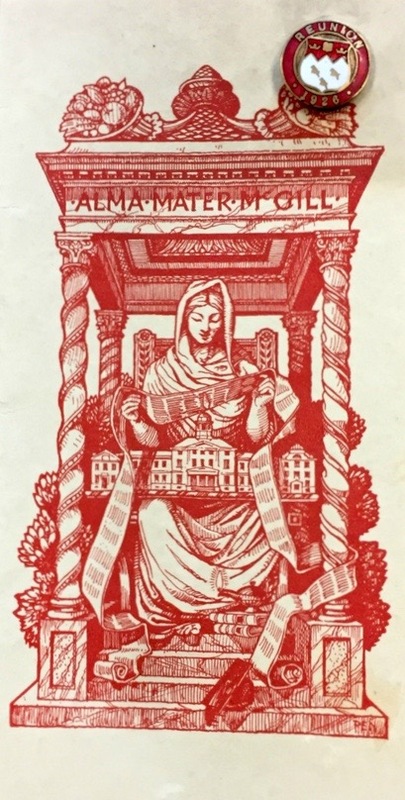 As students and faculty at McGill begin a new academic year this week, we thought we’d offer a historic glimpse into what matriculation looked like 150 years ago. 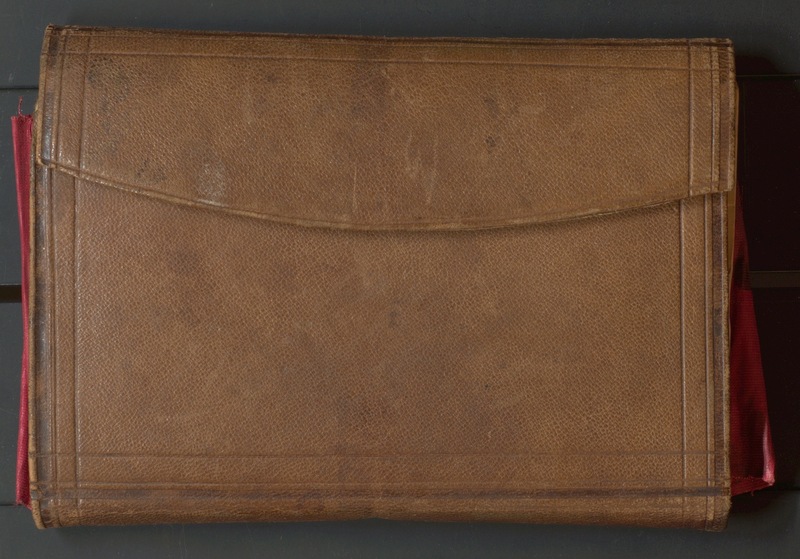 The leather case shown below belonged to pioneering Canadian pediatrician, Dr. Alexander Dougall Blackader (1847-1932). 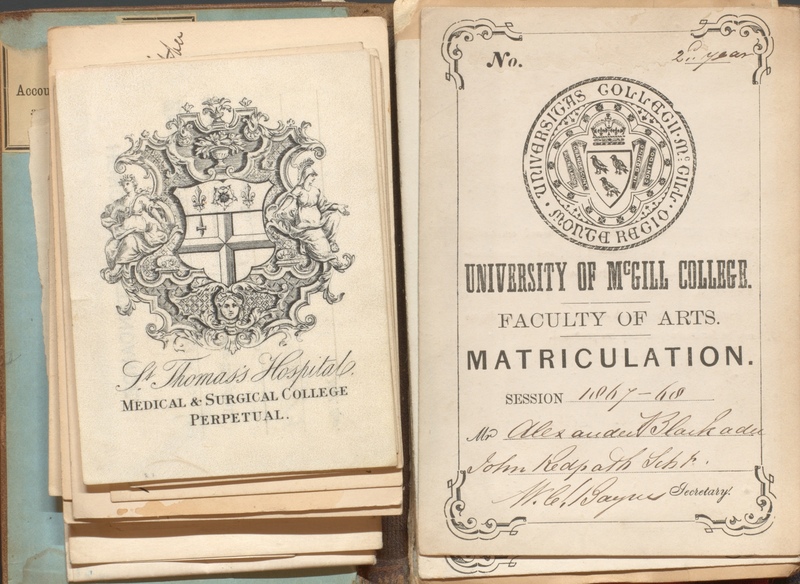 It was used to contain his many matriculation and membership cards from his student days at McGill from 1866-1871. 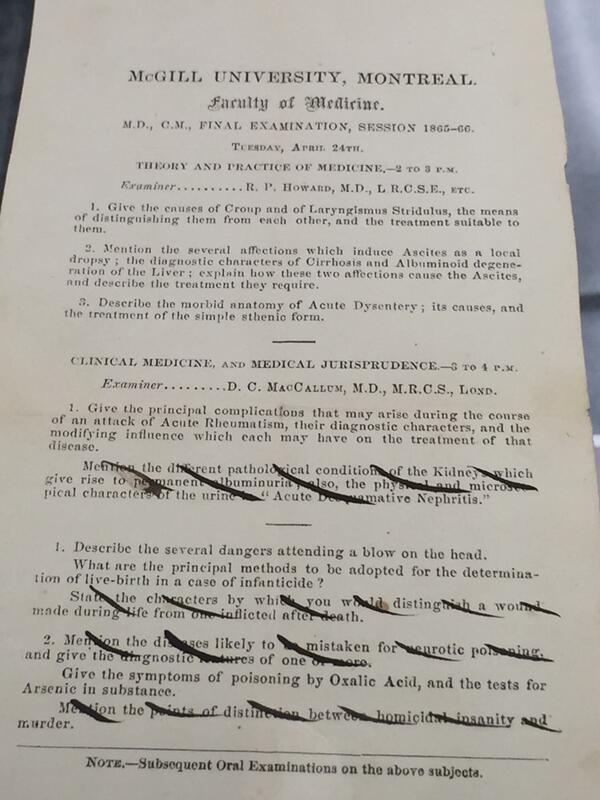 In those days, students were provided with official cards for each course, in addition to their McGill ID/matric and faculty cards. 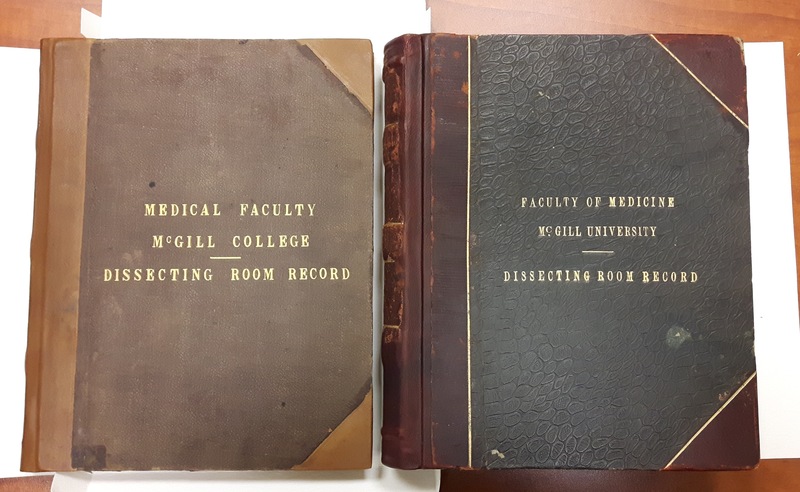 Several years after graduation, Blackader joined McGill’s Faculty of Medicine as Instructor of Diseases of Children and eventually became Professor of Pediatrics and Acting Dean from 1915-1918. 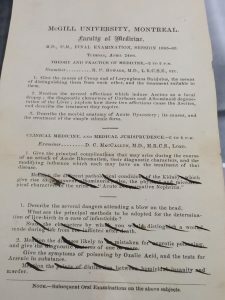 As one of the first physicians in North America to insist that diseases of children needed to be recognized as a specialty, Blackader was an instrumental figure in organizing Canada’s first pediatric clinic at the Montreal General Hospital. 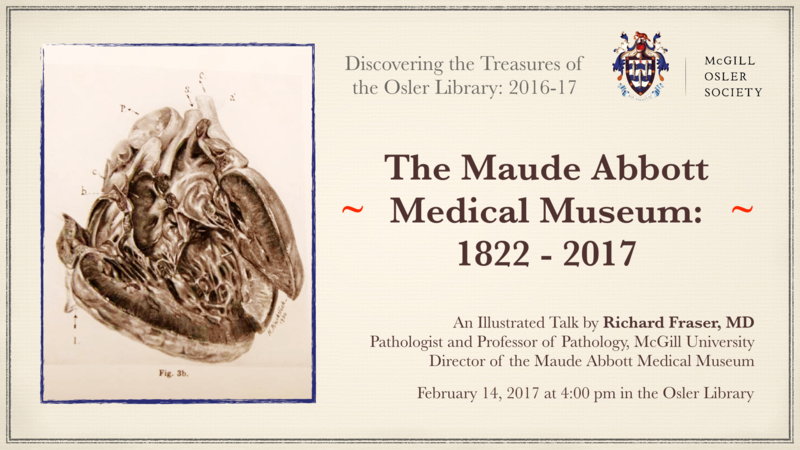 Over the years, Blackader held several positions at MGH before retiring and becoming editor of the Canadian Medical Association Journal. 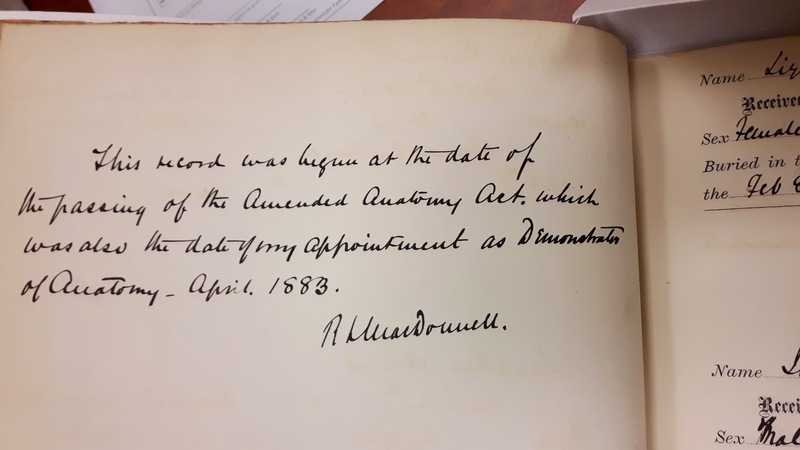 The Osler Library houses a collection of Blackader’s personal and professional material including papers, lectures, autobiographical notes and diaries (P093). Here’s to a great 2016-17! Alexander Dougall Blackader’s leather case from his student days, 1866-1871. Alexander Dougall Blackader’s many matriculation/ID cards and membership cards from his student days at McGill, 1866-1871. 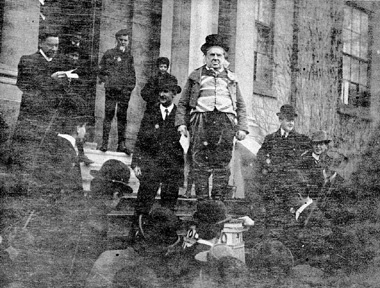 1907 was a fiery year in McGill’s history. 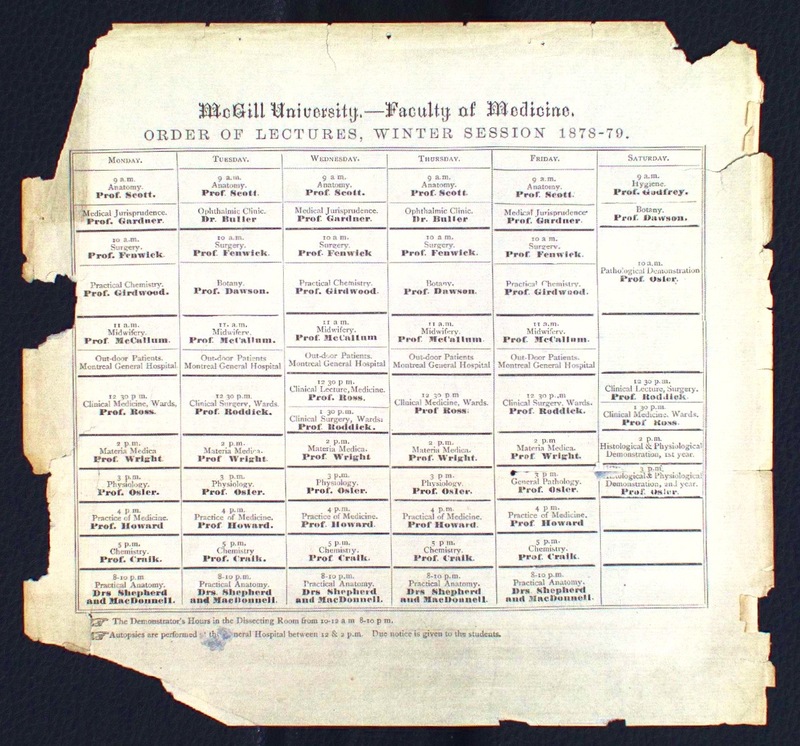 On April 5th, the Macdonald Engineering building was completely gutted by fire, and less than a fortnight later on April 16th, the first Medical Faculty building (erected 1872) went up in flames, destroying the Medical Library (founded 1823) and the first Medical Museum curated by Maude Abbott. The Strathcona Building – now known as Strathcona Anatomy & Dentistry – was built in its place, opening its doors in 1909. 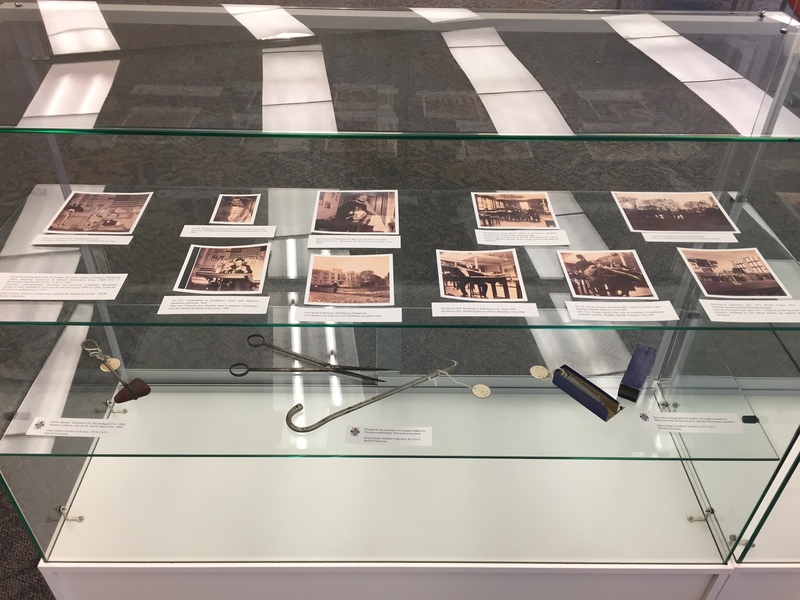 It became known as the New Medical Building and housed the Medical Museum, Osler Library (which opened in 1929), and the resurrected Maude Abbot Medical Museum. 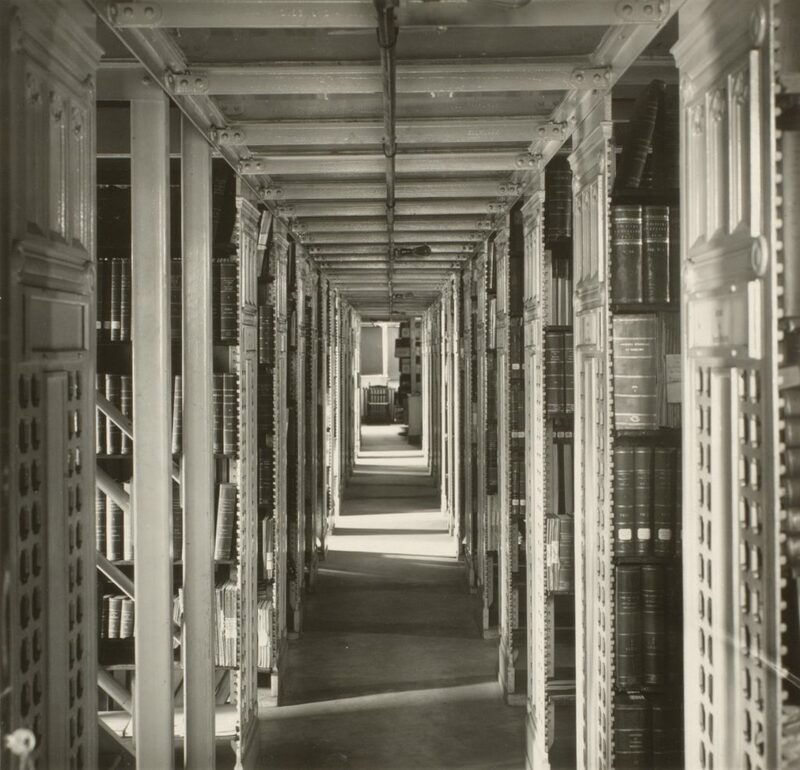 The following photographs show different floors of the Strathcona Medical Library in beautiful black-and-white detail: the well-lit third floor Reading Room, the librarian’s Cataloguing Room, the book stacks, the Bindery, and the empty shelves of the original Osler Library awaiting the overseas arrival of Sir William’s collection. Reading Room, Medical Library, New Medical Building (Strathcona), 1927. 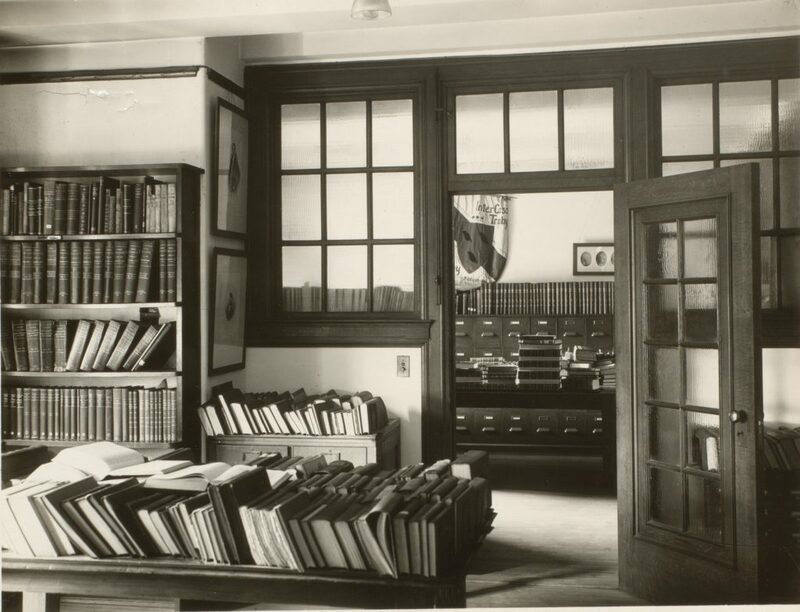 Cataloguing Room, Medical Library, New Medical Building (Strathcona), 1927. Stacks, Medical Library, New Medical Building (Strathcona), 1927. 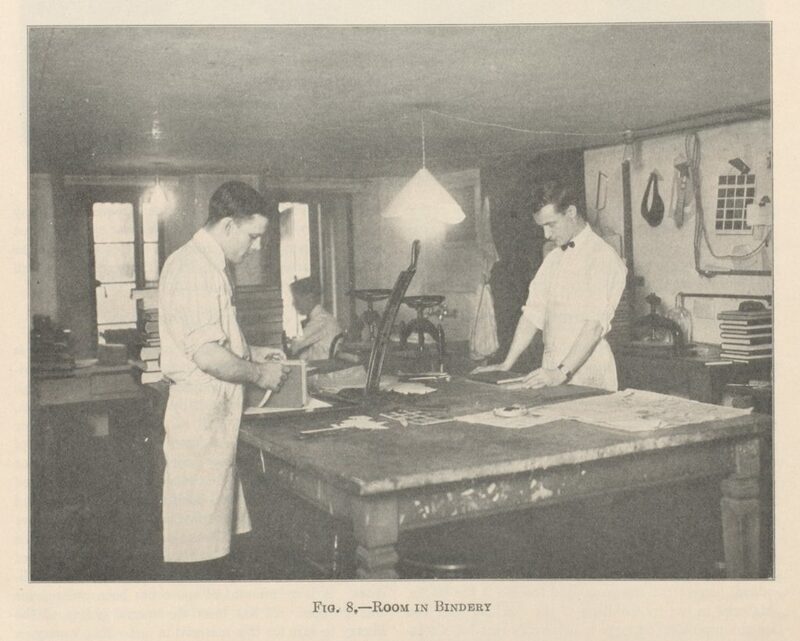 Bindery Room, Medical Library, 1927. 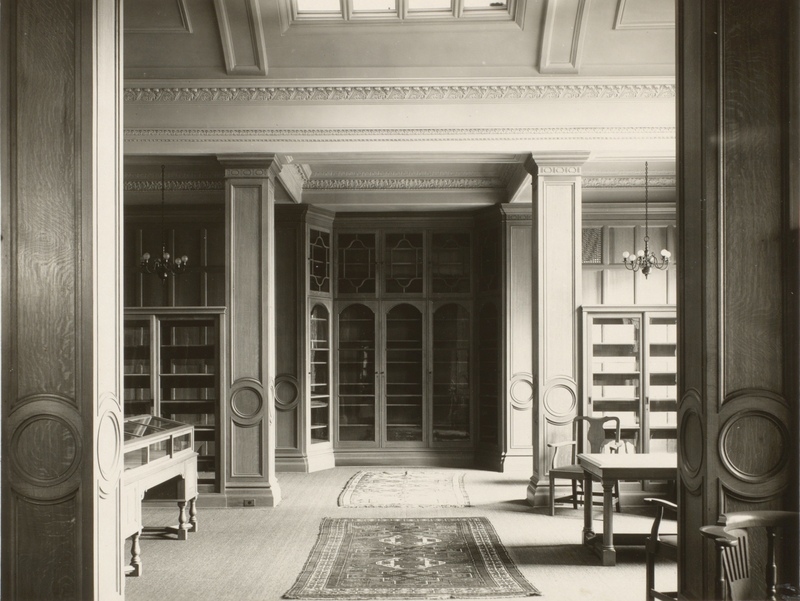 The original Osler Library of the History of Medicine, Strathcona Medical Building, 1927.